The 2001 DCI World Championships were held at Ralph Wilson Stadium in Orchard Park, N.Y., just outside of Buffalo. A very special treat for corps fans was the presence of Dr. Frederick Fennell, who led the massed corps in an Opening Ceremony performance of "America the Beautiful/O Canada." Dr. Fennell, well into his 80s, was easily the most famous living band director in the world. Related Content: Frederick Fennell talks about drum corps At the Finals, the World Champion Cavaliers captured top honors in Visual GE and Music GE, Ensemble Visual, Color Guard and Ensemble Music. The corps' "Four Corners" symphonic jazz suite show was unique in that the musical and visual packages were written concurrently. In some cases, the all-original music was composed for specific drill ideas. While there was no tie at the very top as there was in 2000, Blue Devils and the Cadets tied each other for 2nd place. 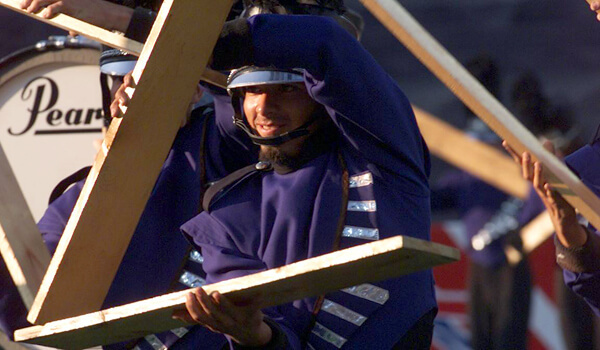 Tenth-place Carolina Crown's 2001 show was titled, "Industry," based on the concept of literally "building" a show out of wood, rubber and metal, the three common materials that make up most of the everyday items we use at home, work and at play. The staff claimed the show partially evolved out of a fascination with watching buildings under construction, with each of the musical selections expressing one of those materials. The eternal workhorse material of wood, used from practically the dawn of humanity, was represented in David Gillingham's "Concertino for Four Percussion," written in 1997. The production opened with percussionists drumming on pieces of wood while many in the color guard and brass sections moved about while propping up planks of wood at different angles. Some in the front ensemble played upon wooden surfaces resembling the tops of bookcases. This led to "Sandstorm" by Darudea, a Techno/Electronica piece. The color guard members picked up all the lengths of wood and spun them around as the horns delved into the angular rhythms of the concertino, eventually spinning rifles of a natural wooden color. Flurries of marimba runs flew by as the horn line members built a dysfunctional decimated teepee-like assemblage out of the boards of wood. The balletic "Main Title" from "The Cider House Rules" by Rachel Portman was used to interpret the elastic and pliable properties of rubber. The 1999 film was based on a John Irving novel and starred Tobey Maguire, three years before he became a superstar in "Spider-Man." Playing on the theme, color guard members rolled rubber tires across the football field. The color of the guard's costuming also changed for each movement to reflect the textures of wood, rubber and metal. Michael Daugherty's "Motown Metal" was inspired by the sounds of Detroit in its automotive capital heyday. Mixing those impressions with the 1960s Motown sound, also from Detroit, Daugherty highlighted instruments made of metal. These industrial sounds were heard at the beginning of the piece as if an invisible assembly line was echoing across the field. Eighteen six-foot-tall metallic thunder sheets, unadorned by design, rumbled as if a storm was approaching. The corps then unveiled flags in metallic shades of silver, copper and bronze. The show ended with percussive blasts of brass shards, leaving the corps in 10th place. Six years later, in 2007, the corps finally broke into the top-6 and then continued to ascend through the ranks, never looking back. For this week only, you can save on the DVD set that contains this complete Carolina Crown performance, along with all finalists from the 2001 DCI World Championships. Buy the 2001 World Championship DVD set. (Available this week only for 20% off. Regular price: $39.95.) Discount DVD offer ends Monday, Nov. 25.